It’s time to plant cool season vegetable plants such as broccoli, cabbage and, kale. Prep the garden by tilling or working the soil with a shovel so it is loose to a six-inch depth, at least. All large clods should be broken up and rocks larger than a nickel removed. After prepping, rake fairly smooth and mark straight planting rows. An easy way to mark the rows is to tie string between sticks or dowels spaced at the end of each row. Use the tip of a trowel or even a rake handle to then make a shallow furrow along the string to sow peas, radishes, beets, turnips, mustard greens, potatoes and onions. Most veggie seeds need no more than 1/2" of soil covering them. Instructions are also on the seed packets. 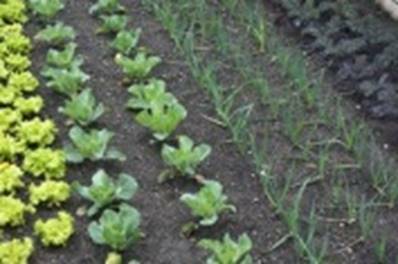 Delay planting your garden if the soil is too wet. If a handful of soil remains in a tight ball after squeezing in your palm, it is too wet. The ball should crumble into smaller clumps. March is the time to start seeds indoors for tomatoes, peppers and eggplant. Soilless mix is best to start them in to prevent soil borne diseases from killing the seedlings. Keep evenly moist, not wet, but do not allow to dry out. This is a great time to repot root bound houseplants. A good rule of thumb is to increase the pot size by no more than 2” in diameter. Loosen tightly wound roots before repotting. Take care not to break the root ball; you simply want to loosen the roots to encourage growth into the new soil it will be placed into. Also, don’t plant the soil surface any deeper than it was originally. In other words; don’t cover the top of the original soil. 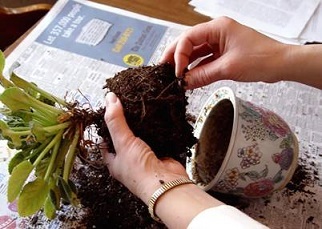 If the pot is deeper, place soil under the root ball to lift it higher in the pot but leave about an inch of space between the top of the pot and the soil to allow for watering. Use a water-based fertilizer. Flowering bulbs need a dose of fertilizer once the leaves begin to grow, but before blooming. Fertilize your bulbs (tulips, daffodils, hyacinths, etc.) by broadcasting a bulb fertilizer or bone meal over the area. Lightly scratch the fertilizer into the soil surface. Be sure to wash off any fertilizer that sticks to the leaves. 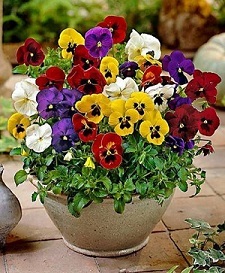 Add some spring color by planting pansies in beds and in containers. They can take cool temperatures as well as a layer of snow. Pansies will bloom again when the temps rise above 40 degrees. Cleanup your planting beds by removing dead foliage, fallen leaves and weeds. Now is also a good time to dig and divide your perennials that bloom in summer and fall. 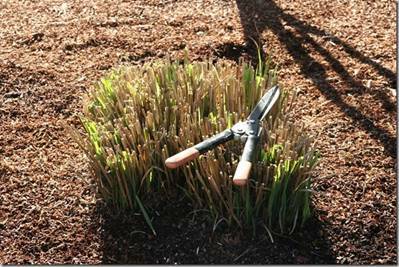 Cut back ornamental grasses to 8-10” if that hasn’t already been done. Start pulling mulch back from perennials and roses so the soil can warm quicker. Remember though; be ready to push it back around them if we get a cold snap. Speaking of a cold snap; You can protect tender plants from a light frost by covering them with sheets. Don’t cover plants with plastic since it will freeze to the leaves. There isn’t much you can do to protect against a hard freeze. Snow can help insulate sprouting perennials so don’t be tempted to remove it.